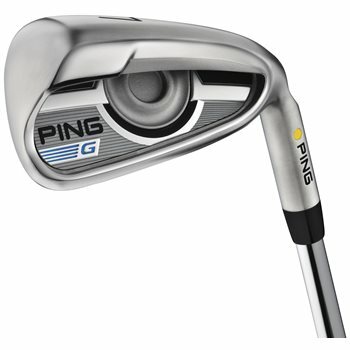 The Ping G Irons not only look good, but are built to provide distance and forgiveness. The stainless steel club head construction features heat treatment to increase the strength of the material by 40%. This allows Ping to implement a thinner face, adding an additional 5 yards of carry to each club. These irons also feature Cor-Eye Technology to increase face flex for faster ball speeds of 1.25 MPH across the face, giving you improved distance and control. The weight on these irons is concentrated in the perimeter of the club. This allows for an increase in Moment of Inertia, or MOI, for consistency and accuracy. Ping has also given these irons a deeper center of gravity to provide a higher launch, more distance, and more control, all factors to help you hit and hold more greens. Cor-Eye Technology for faster ball speeds. Review by Londberg, 1 year ago. Do you have any pictures of the condition of these clubs it sounds like they are pretty worn? What is the serial number for these clubs? Good point, hadn't thought of that. What is the best way for me the consumer to protect myself by verifying the serial number prior to purchase? Or is that guaranteed by 3balls and I would simply verify with Ping when the clubs arrive with a refund if something doesn't match up? Due to the problem with people making counterfeit clubs, we are not allowed to post that information online. what clubs make up the set of irons? Please reference the information to the right of the picture. Depending on what is available, the set make-up could vary. For example, if the type states the set is 4-PW, the set will include the 4,5,6,7,8,9, and pitching wedge. This is just an example though and could not reflect what is currently available. is this quote in aud?